The authors take the reader on a world tour highlighting innovative businesses that have found a balance between male and female attributes. They propose feminine values drive broad business benefits by creating lasting and mutually beneficial relationships with customers and communities. They suggest the pursuit of happiness and prosperity is not possible apart from supporting ourselves, our employees and our customers. The book argues no business can be successful today unless it fosters an environment of cooperation, communication, nurturing and inclusiveness. Through numerous examples, they show today’s innovative companies are flexible, collaborative and caring. This proposition is versed best in the authors’ own words, “Feminine values are the “operating system” of 21st century businesses”. The book proposes businesses should be social, interdependent and transparent. This is done by fostering an environment of cooperation, communication, nurturing, inclusiveness, flexibility, collaboration and caring. These attributes create a competitive advantage by promoting collaborative innovation. Economic growth and social growth advance hand-in-hand and are not competitors for limited resources as is often thought. The primary business questions should be: “What can my company and my coworkers do for our customers? What can we do for our market? What can we do for our society?” So-called Athena business enjoy profits while creating value through lasting relationships with customers, coworkers and communities. The book demonstrates that fairness prevails and ego becomes a liability. The authors argue the individual who promotes his ego or self-agenda will not succeed in today’s world. The reader is encouraged to disregard ego and strive for modesty and kindness. Champion fairness as a core value. Past failure is the key to future success and when that success arrives, the credit is shared. There is no room for protecting one’s reputation and finger pointing. Fidelity trumps personal benefit and supports long term goals for growth. Finally the book argues that agility builds competitive advantage. When managing change, nothing is complete or perfect. We are always learning and agility becomes an asset. Move swiftly and learn on the fly. See the world through the eyes of your clients, coworkers and community. Listen, communicate and be flexible. 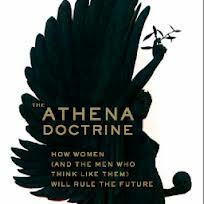 Business Takeaway – The following are ways the Athena Doctrine can be applied to business. Define leadership through devotion not passion. Be patient and plan for the future. Encourage cohesiveness, collaboration and agreement. Before one dismisses the Athena Doctrine as a touchy-feely new age business fad, observe closely the opening to the 2013 Apple Developer’s conference. This introduction is an excellent example of the Athena Doctrine rolled into a simple advertisement. This entry was posted in Good Books & Papers and tagged Athena Doctrine, book review, Larry Lawhead. Bookmark the permalink.